The numbering follows the walk numbers of the official programme, use them to reference the walk descriptions. Where possible I've added links to pages with pictures from my earlier visits and walks (during the walking weeks as well as individual walks) to give you an impression of the area. The week starts with DJ taking us around Dunlossit estate, which means I'll have to be there for the Saturday. His walks are always very interesting, as he knows so much about the history of the places he takes us to and explains them so well. We visited parts of the area during the Lossit and the Sound of Islay walk in 2004. I also remembering walking along Loch Allan in 2005, unfortunately the weather was quite wet then and stopped me from taking any pictures. The walk on Sunday covers new territory for me, I haven't been in that exact area before. The closest I've been to it was probably my walk in the north-east of Islay during August 2005. Lindy should know the area very well, she lives in Bunnahabhain where her husband is distillery manager. And walking with Bryony should be fun, as long as we avoid crossing any burns on the way. Should we have good weather I expect great views from Giùr-bheinn! The dunes near Killinallan are very nice and I expect lain MacPherson will have some nice stories to tell. The best pictures of the area I have are from a visit in 2001 (scroll down). I've already mentioned Clare Balding walking on Islay with the Ramblings program in an earlier entry. I've been on a number of walks with Florrie MacAllister, although I think this will be the first with her leading it (the last time she led a walk I was on a different walk). I don't have any pictures of the area around Port Ellen and Brahunisary, so I'm looking forward to taking a few while learning about the history of the area. Jack Adamson has led quite a few walks I've been on, including the long walk to Bholsa and Rhuvaal last year. This time he'll take us to Beinn Chalm and Loch Leithen. Another area of Islay I haven't really been to, so I'm looking forward to see this part of the island. 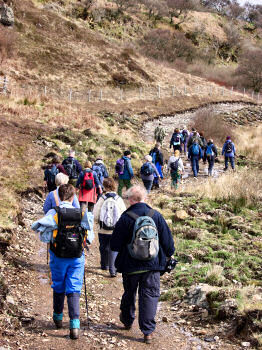 Walk 6 is the shorter alternative to Jack's walk, it will leave from Scarrabus to Loch Cam. Unfortunately I don't have any pictures from this part of Islay. Colonsay is always worth a visit. I hear the tide will probably be wrong so a walk to Oronsay unfortunately won't be possible. But the alternative walk from Garvald out to Ardskenish should also be nice and give me the opportunity to take more pictures. This walk is currently at risk, as for the time being the pier in Port Askaig is closed, meaning the ferry isn't going to Colonsay. I understand James How is considering an alternative on Islay, I suspect this will be somewhere near Loch Gruinart. For those staying on Islay there will be various choices, among others around Port Ellen. As I hope to go to Colonsay I can't say much more. Jura is fantastic for walking, I've had two great walks with Gordon Muir in 2005 and 2006. The area should be similar to the walk in 2005, just a bit closer to the famous Paps of Jura. I certainly hope to go on this walk! Those not going to Jura can go on a walk near Loch Gruinart with the RSPB. In particular birdwatchers should enjoy this walk. I've never been to the hide, so I can't really comment on this walk apart from that I assume parts of the walk will go through the Loch Gruinart Woodland. While those on Jura will be on the second half of their walk there will be another walk on Islay in the afternoon, but there aren't more details apart from that it will be a circular walk. Past experience tells me that the Friday will arrive all too quick. But the walk to Tighnaspeur should be very nice, as I expect a nice view over the south coast of Islay from the Sky House. Also an area I haven't really been walking in so far, meaning another opportunity to take more pictures. The last walk of the week will be in Bridgend Wood, you can get an impression of it from the last stretch of the Islay House and Bridgend walk in 2004. The soup and sandwiches should be very nice in front of the open fire, which I hope will be on! Walk #14 around Bridgend for the final, also because I'll be staying in Bridgend this year.